From the brilliant minds behind the highly acclaimed Tribal Wars comes another equally impressive Real-time strategy city-building game, Forge of Empires. Your main goal in the game is simple, expand your village and transform it into a successful city with a sustainable community. What separates the game from other city-building games is the impressive transition from one era to another. You start off with a simple village during the Stone Age era and will gradually progress through the different periods of time until you have reached the virtual future. 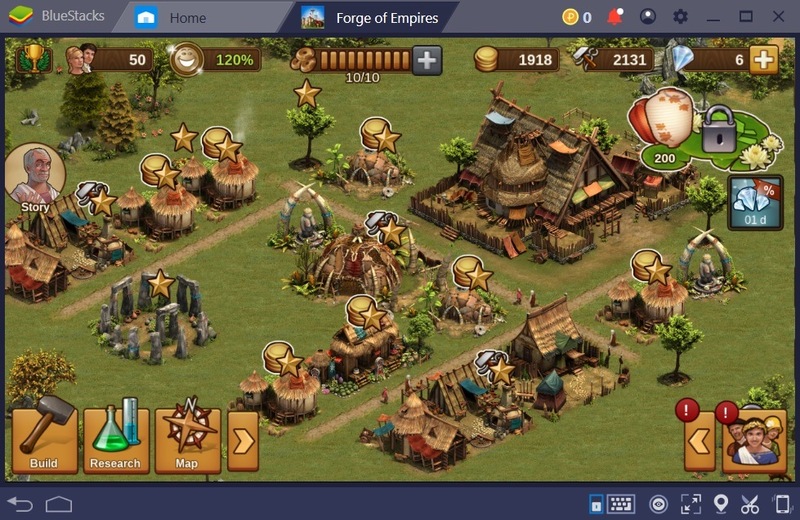 Empire-building RTS games like Forge of Empires are often characterized by their remarkable longevity. It’s definitely not the kind of game that you can finish in one sitting. It requires a lot of patience as most constructions will take a lot of time especially when you have reached higher levels. Unless you have a huge amount of diamonds to spend, you’re going to have to go through a long wait to progress in the game. Of course, with BlueStacks 4, you cannot just emulate the game directly on your PC but you can also embrace some of its special features that you can use for a full gaming experience. 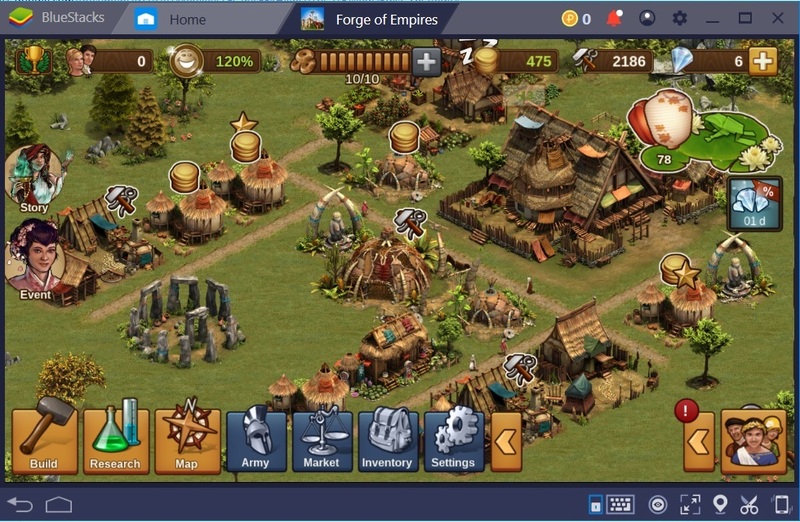 BlueStacks 4 can be an effective platform for a game like Forge of Empires. Aside from giving you smooth gameplay and wider gaming resolution, you can also utilize some of its useful features. Allow us to give you a quick guide on how to progress quickly in Forge of Empires using BlueStacks Features. When it comes to a city building game, collecting is one of the most important tasks you need to perform. You will be asked to collect various resources such as coins, supplies, and goods. This is very important as you will be needing these resources to upgrade your city to its maximum potential. You must construct Residential buildings to collect coins, the most common currency you use to upgrade buildings, train troops and produce goods. Production Buildings, on the other hand, allow you to produce supplies while Military Buildings allow you to train troops. Since you will start off from scratch, the first phase of the game is somehow manageable. You collect all the resources by tapping or clicking on each building manually. Yes, you need to do it manually and that’s where the BlueStacks Combo Key feature comes in handy. With BlueStacks’ Combo Key function, you can record all your actions and perform them repeatedly using a single hotkey. Therefore, instead of multiple clicks, you can save your time and effort by repeating the same action by pressing a single key. This will display a new panel on the far left side of the BlueStacks window. Located above the panel is the “Key Sequences” portion. Click the plus icon (+) to display the “Start” and “Pause” buttons. To start recording, click the red Start Button and start performing your actions. Once done, click the Pause button and assign a shortcut key. It is ideal to create a separate sequence for Residential buildings and Production Buildings. You must also position the screen on proper coordinates to execute this trick effectively. When adding new buildings or expanding your empire, you might need to record a new sequence and overwrite the previous ones. BlueStacks 4 is more than just an Android Emulator. It comes with many impressive features that take your game to a whole new level. One of these features is BlueStacks Multi-Instance. 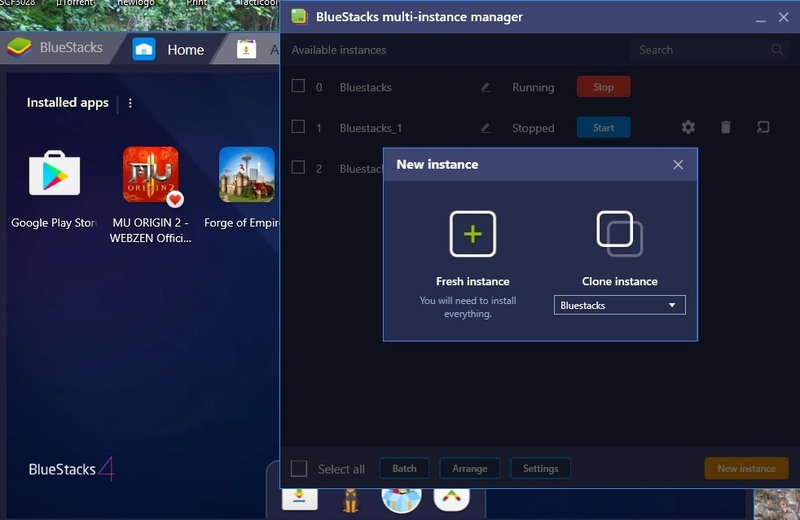 This particular feature allows you to create a new instance, a separate BlueStacks Window which you can either clone from your main account or create a new instance. 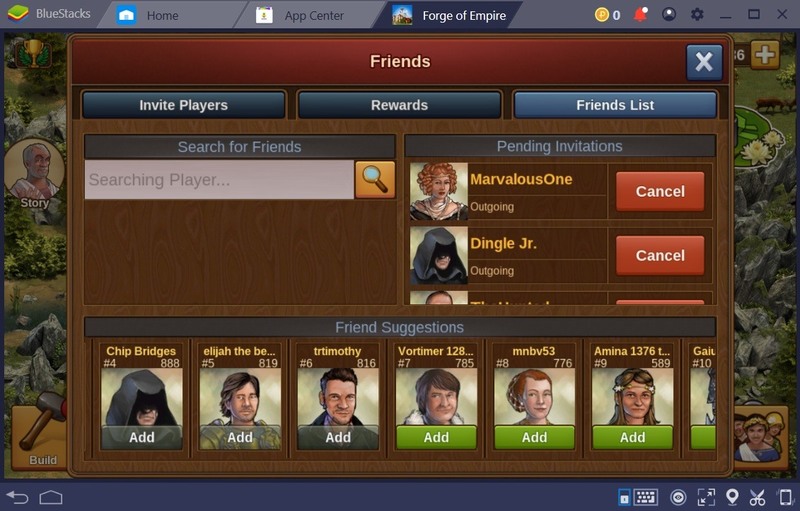 For Forge of Empires, you can create a new instance in order to create a new account. It means that you need to create a new Google account and download a new Forge of Empire app from the Playstore. So how exactly does this feature help you? 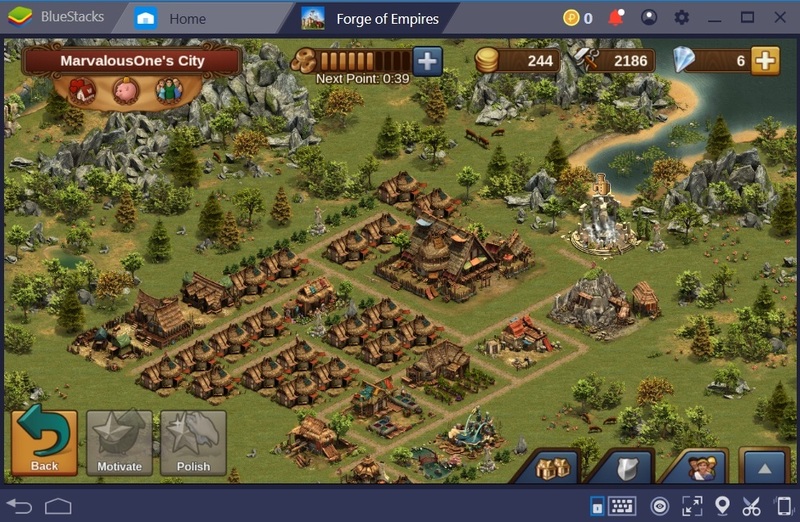 Forge of Empires comes with a multiplayer function. You can invite real online players and make them part of your friend list. Players can visit friends and help them in many ways. A friend can help you speed up the construction and production time. 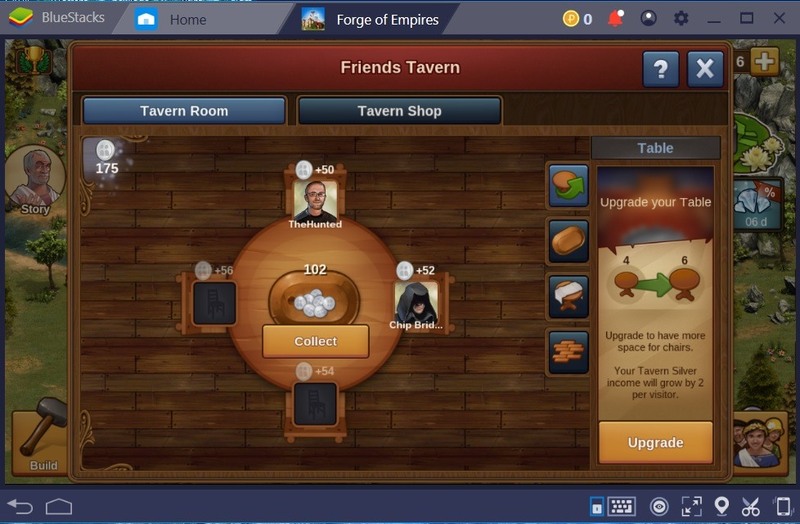 A friend can fill the slot on your Tavern and allows you to earn Tavern Silver (a special currency used to buy boosters). With the newly created account, you can easily fill the role of a new friend. Therefore, you can contribute to your main account and perform all the actions above without waiting for other players to accept your friend request. Friends Tavern plays a great role in the game. It gives you access to Tavern Shop that allows you to buy Special boosters. These boosters allow you to speed up the production and construction time. Therefore you can easily complete quests and earn rewards in return. Great Buildings, on the other hand, are a great addition to your empire. They can supply you with Forge Points which are mainly used to conduct research and unlock new technology. This is very important to progress quickly in a new era. Take note that you only get a Forge Point after every hour so while waiting for the forge point bar to be refilled, you can always take advantage of the Great Buildings and earn extra points without waiting. 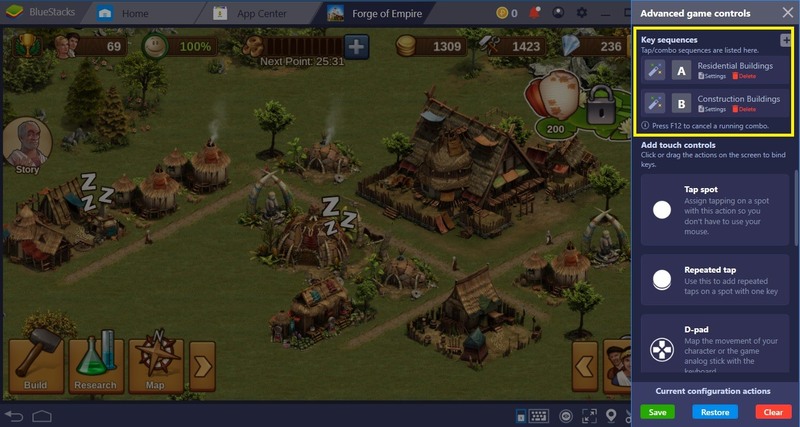 Both Combo Key and Multi-Instance can help you progress quickly in Forge of Empire which makes BlueStacks 4 an ideal platform to play this game. Not to mention the impressive game performance brought by the powerful Android N (7.1.2) which makes it 6x faster than the latest Samsung Galaxy S9+ . 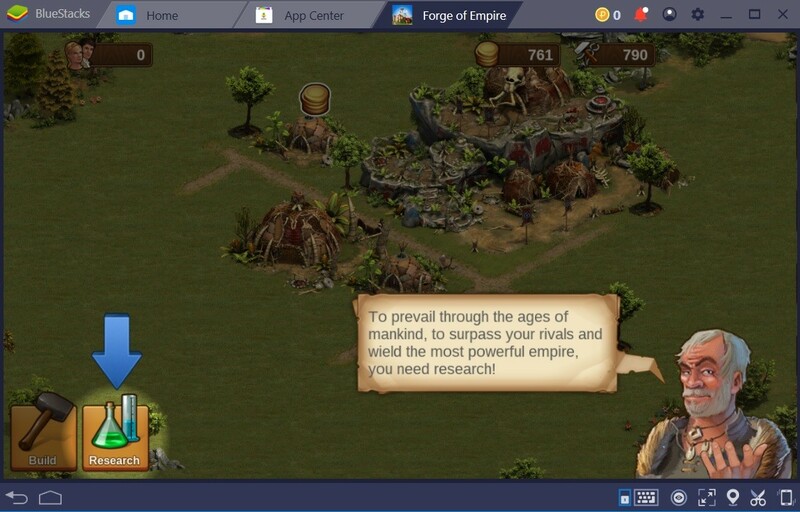 Now that you have learned these useful tips on how to progress quickly in Forge of Empires using two of the most effective BlueStacks 4 tools, feel free to download Forge of Empires on your BlueStacks 4 and let your epic journey begins!